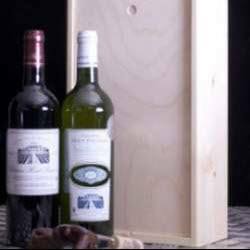 Two bottles in a wooden box a brilliant wine gift. 1 bottle of red wine Chateau Haut-Pougnan Bordeaux and 1 bottle of white wine of Chateau Haut-Pougnan Entre-Deux-Mers. You can mix the wine either 1 red and 1 white or 2 red or 2 white. White wines are ideal for drinking young. They adapt wonderfully to dishes of fish and seafood.